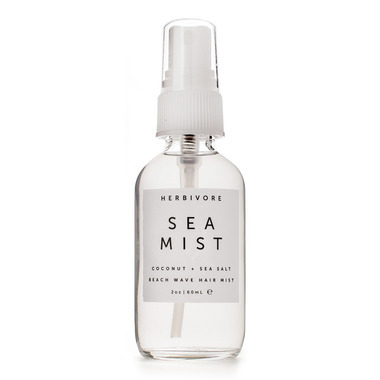 Herbivore Botanicals Sea Mist Coconut Hair Texturizing Salt Spray is formulated with the same salinity as the Pacific Ocean. This spray is great for adding beach-y texture and waves to hair naturally. The essential oils of coconut and vanilla give off an exotic aroma. Aloe Vera: Light weight and hydrating, aloe is a perfect counterpart to the sea salt and works to keep hair moisturized, balanced and healthy. Sea Salt: Besides adding instant texture to your hair, sea salt is also great for the skin as it is naturally cleansing and detoxifying- making this a multi-use spray. Directions: For Hair: Spray on any time to add waves and texture to your hair. Will give your hair a beach-y texture like swimming in the ocean's natural saltwater. For Body: Spritz on any time your skin needs refreshing or just spray into the air in the room around you to liven and freshen things up. Contains aloe water to hydrate your skin. Safe to use on face. Avoid spraying directly into eyes. Beautiful natural fragrance and free of all the usual nasty ingredients and allergens. Gives a nice amount of body and texture for my fine, curly hair. Doesn't really assist with curls but gives a bit of weight. Love it. Feels great/ smells great! Makes my hair soft and smells nice, but does not define my curls. Smells nice, but made absolutely no difference to my hair. Best smelling product out there. Not a really the greatest results but Iâ€™ll order from now on for the smell! I am not overly fond of coconut scents but the smell really is great. I like that I can smell it lightly throughout the day. I love the look of the bottle, it is super cute, great little size, but it doesn't seem to do much for my hair (which is shoulder length, thick and wavy). I have tried beach wave products from other companies that have worked fine but with this one, I find it hard to notice results, sadly! Love the smell! It provides nice texture - had bought travel size to try, am now purchasing the big size! I like the texture this gives my hair, very tousled! The coconut scent is nice too! Smells amazing! I love the coconut scent. Wish the product had a bit of hold to it but does what it claims. Coconut Sea Mist is amazing. Smells delicious...gives my hair texture...has no garbage ingredients...refreshing. I bought the travel size just to try it....I like it so much I will be purchasing the BIG ONE next time for sure! I love this product! I have naturally straight hair, and I use this when I want to add texture to dry, wavy hair (either from a curling iron or overnight heat free curls). It smells like a tropical holiday, but the smell fades pretty quickly after application, so it doesn't cause any issues with my scent-sensitive coworkers. LOVE this product. I use it after I wash my hair and I use it on dry hair when I need a boost!! This did nothing for my hair wave wise, but gave it a little texture. I also think it would work better on thinner hair. I gifted it to my Mom and hopefully she has better results. Smells amazing! I spray it on just to refresh my hair. I don't think it actually does much for texture; I've tried other sea-salt sprays and had better luck. I have pretty thick hair, maybe it would be better on finer hair? But I am obsessed with the smell and would definitely re-order for that reason!